Umbrella bamboo or fargesia murieliae is a bamboo species that lends itself very well for hedging purposes. People do not often think of bamboo as a suitable hedging plant, and we can understand that. Not only is bamboo quite far removed from the image of a neatly trimmed, formal hedge that immediately comes to mind when thinking of hedges, many bamboo species tend to be too fast-growing and invasive to even be considered for hedging. Umbrella bamboo, however, is one of the most suitable bamboo species for hedging purposes, as it non-invasive and clump forming. It is an exceptionally hardy hedging plant that can deal with a wide range of temperatures. Umbrella bamboo is certainly strong and versatile enough to thrive in just about any British garden. Many people who choose to plant bamboo in their gardens as a thicket or a single specimen are looking to an add exotic flair to their gardens. We can certainly see why people would do that, as the unique appearance of bamboo, with its thick stems and long, fresh green leaves, is bound to add a somewhat oriental flair to any garden. However, umbrella bamboo also makes an excellent screening hedge. The smallest umbrella bamboo suitable for hedging, the dwarf cultivar ‘Simba’, can reach a height of about 2 metres, while the popular ‘Jumbo’ cultivar can grow to become a tall, dense screening hedge of about 3.5 metres in height. Since this non-invasive species is also relatively easy to maintain, umbrella bamboo is simply an excellent plant for hedging purposes. It should not be too surprising that the appearance of umbrella bamboo is often associated with East Asia, as umbrella bamboo originates from the mountains of central China. The species was introduced to British gardeners by the English plant collector Ernest Henry Wilson, who discovered the plant during one of his expeditions to the Far East in the early twentieth century and named it after his daughter Muriel. Umbrella bamboo closely resembles fargesia nitida, also known as red bamboo or fountain bamboo, which is another popular non-invasive species for bamboo hedging. You do not need to be an experienced gardener or plant enthusiast to tell the two types of bamboo apart, however, as umbrella bamboo can easily be distinguished by its yellow canes, while fargesia nitida has red or bluish canes, depending on the variety. While its use in the West is mainly limited to planting it in gardens for ornamental purposes, umbrella bamboo is actually an important raw material in East Asia. The plant is harvested in order to produce paper and timber and it is even used in the kitchen, as a material to fashion utensils or even as a component of certain dishes. However, growing a hedge or a thicket simply for its aesthetic value is not the only way you can use umbrella bamboo in your garden. Its relatively thick, strong stems can also be used to support heavier plants, such as the large flower heads of some hydrangea varieties. These stems or canes are bluish green when they are young and will eventually reach a yellowish green colour. Unlike many other bamboo species, umbrella bamboo is an excellent plant for hedging purposes and does not require a lot of maintenance. When you plant an umbrella bamboo hedge in your garden, there will be no risk that it will push up tiles or show up in the garden of your unsuspecting neighbours. An umbrella bamboo hedge can be planted in just about any soil type and position, though it generally has a preference for a position in the sun or partial shade and a soil that is moist, slightly acidic, fertile and well-drained. Umbrella bamboo can handle temperatures from -25°C to about 40°C. In other words, the temperatures that this hardy, versatile hedging plant cannot handle are so rare in the UK, that you do not have to worry if it will survive the winter or the summer. 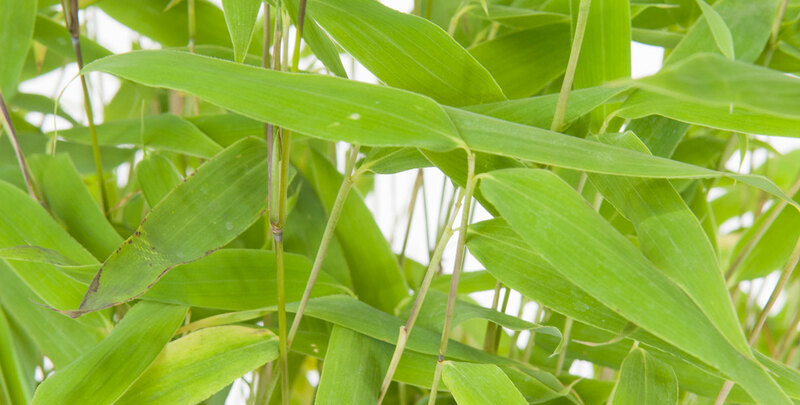 Though umbrella bamboo, much like other bamboo species suitable for hedging, is an evergreen hedging plant, it is not unlikely that the plant will shed a few leaves in late autumn. Most of its foliage will last through the winter, however, so you do not have to look at its bare stems during the cold months. It also shares its fast growth rate with many other bamboos, though the ‘Simba’ cultivar will only grow 25 to 50 centimetres per year, which is relatively slow compared to the ‘Jumbo’, which has an average annual growth rate of 50 to 75 centimetres. Regardless, your umbrella bamboo hedge does not need to be pruned at all, though its tolerance of pruning and fast growth habit allows you to cut back the species as rigorously as you please. Why Choose an Umbrella Bamboo Hedge? While bamboo is not the first plant that comes to mind when people think about hedging, umbrella bamboo has proven that it is just as capable of forming a beautiful, dense screening hedge as any other evergreen hedging plant. An umbrella bamboo hedge is sure to add a different character to your garden than a traditional formal evergreen hedge will. This is of course the reason why some gardeners favour a bamboo hedge, as the Far East is suddenly not so far away anymore when you have an umbrella bamboo hedge in your garden. Additionally, the non-invasive umbrella bamboo does not have any of the characteristics that make many other bamboo species unfit for hedging and the plants require very little maintenance. And since it is also quite versatile when it comes to soil types and positions, an umbrella bamboo hedge will not cause a lot of worries after it has been planted.